The electronic music scene has become a particularly cluttered place in recent years. With more synthpop outfits than you can shake a stick at, it’s become tough sorting the wheat from the chaff. Partially, this is due to an overspill of acts who are unable to escape the trappings of their influences. With so many outfits either crafting their style around the sounds of 40-year-old bands or “borrowing” riffs and elements from the same, filtering out the quality presents a challenge for even the most ardent listener. On that basis, it’s easy to assume that because a contemporary synthpop outfit cites classic 80s period bands as influences, they can never be anything more than either a pastiche act or a tribute band in all but name. Marsheaux, on the other hand, demonstrate that it’s possible to cite classic synthpop influences, yet can craft quality contemporary electronic music without sounding like the 3,451 Depeche Mode knockoffs that play in the Dog & Duck on a Thursday night. In fact Marsheaux’s ability to rework songs into whole new dynamic arrangements has resulted in the Greek outfit being called upon for remix duties for a wide range of artists. Their work on Katie Perry’s ‘Hot N Cold’ resulted in a dancepop floor filler that destroyed any criticism that electronic dance music was purely “noise”. Marsheaux’s only failing perhaps is the fact that they’ve set their own bar so high, particularly since the release of the phenomenal Lumineux Noir in 2009. That album demonstrated a clear linear progression from their early material through to the bold, impulsive electronic masterpiece that few acts have managed to emulate. Now comes new release Ath.Lon, which takes its name from a compression of Athens and London (a nod to the fact that Marianthi has relocated to London, while Sophie has stayed in Greece). It’s also perhaps a demonstration that geographical locations don’t matter all that much in the modern age. After all, OMD constructed most of their 2010 album History Of Modern while Andy McCluskey and Paul Humphreys were at opposite ends of the country, while rock outfits such as Minor Victories have yet to set foot in a studio together at all. Opening track ‘Burning’ is constructed from all the familiar Marsheaux elements: buzzy, muscular percussion, sweeping synth washes and the whispery vocal trills of Sophie and Marianthi. Its insistent bassy tones serve as a perfect overture for the album as a whole. Meanwhile, ‘Like A Movie’ owes some of its melodic touches to When In Rome classic ‘A Promise’ (a tune that Marsheaux have previously covered). 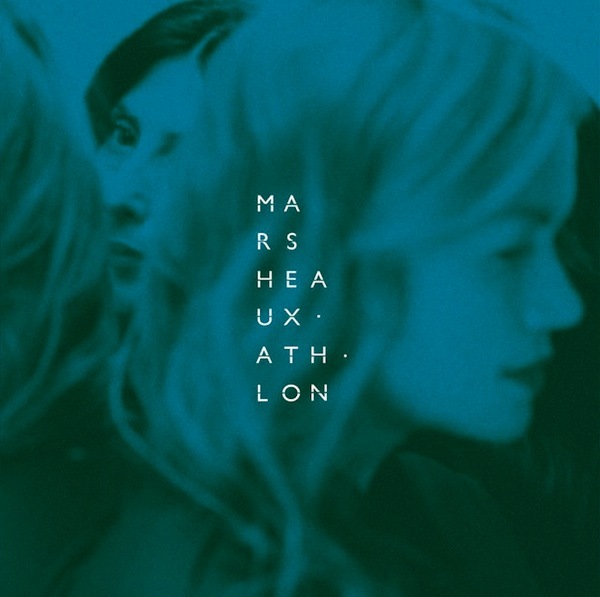 Listening to the lyrics such as “It’s like a game but no fun, no more/we go on, on and on”, it could suggest a reverie on Marsheaux’s musical career arc. But if there’s one thing that Marsheaux do well it’s an ability to be cryptic and much of their lyrical output can be open to interpretation. ‘Sunday’ is a stately procession of alternating synth melodies with an immersive element to it, while ‘Wild Heart’ with its throbbing rhythms and lonely bass offers up a reflective moment. Elsewhere, the widescreen pop of tunes such as ‘Now You Are Mine’ and ‘Strong Enough’ demonstrate a confident grip on modern electronic pop music. All symptomatic of Marsheaux’s talent for warm and engaging electronic melodies. ‘Safe Tonight’, which preceded Ath.Lon as a single release, has that perfect combo of catchy synth hooks, cascading melodies and warmth that could almost be a lost Lumineux Noir track. “Close your eyes/You’re safe tonight” is the song’s beacon call as it invites the listener to bathe in pure electronic pop goodness. Closing track ‘The Beginning Of The End’ delivers a brooding cinematic masterpiece whose sweeping orchestral score is the perfect frame for this ominous lament. It’s an approach that Marsheaux dip into only occasionally (the epic ‘Sorrow’ springs to mind) but it shows that the Greek outfit have many colours to their particular electronic palette. As ever, Ath.Lon is a beautifully packaged album – something that’s become a mark of pride for record label Undo – with a particularly fetching effort on the Limited Edition release. Along with a series of art cards (with the album lyrics) there’s also an additional CD of bonus tracks, which includes the buzzy muscularity of ‘Treasure’ and soaring synth perfection of ‘Happiness’ among others. As a Marsheaux album, Ath.Lon isn’t necessarily breaking any new ground as such but demonstrates an outfit that are confident within their own particular sound. They remain far in advance of their contemporaries regardless and this album has to be an essential addition to any electronic music enthusiast’s 2016 catalogue. Ath.Lon is out now on Undo Records. Marsheaux perform live at TEC004 in Norwich on 5th November 2016. Ticket details: https://www.ticketsource.co.uk/date/248712.